Every registered GST taxpayer needs to file a monthly return that comprises of all the details of the outward supplies made to the customer for that month. This is a monthly return dealing with the outward supplies transaction is the GSTR-1. The GSTR 1 filed by a registered person is further used by the government to auto populate GSTR 3 for the supplier and GSTR 2A for customers to whom supplies have been made (Recipient). Who has to file GSTR-1? Every registered normal taxpayer is required to file GSTR- 1 irrespective of the number of transactions carried out during the month. 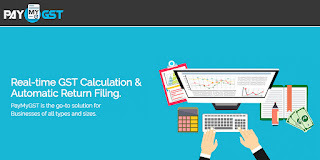 Month & Year – The month & Year for which return is to be filed should be selected. 1. GSTIN – Every registered person is allotted a state-wise PAN-based 15-digit Goods and Services Taxpayer Identification Number (GSTIN). 2. 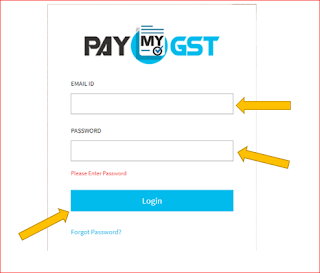 Name of the Registered Person – This section will be auto-filled at the time of logging into the common GST Portal. 3. Aggregate Turnover in the preceding Financial Year – This information is required to be filled only during the first year of GST after which it will be auto-populated from the details of the previous year. Aggregate Turnover for the quarter – This information should be filled by the persons who don't have any business in preceding years (i.e. 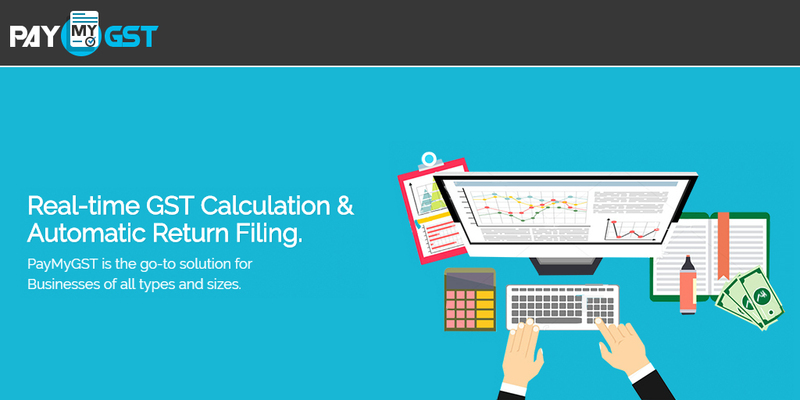 newly start up) only during the first year of GST after which it will be auto- populated. 4. Taxable outward supplies made to registered persons (including UIN-holders) – Under this heading, the taxpayer needs to fill invoice wise details of all the taxable supplies made to registered persons including any supplies made under reverse charge mechanism or made through e-commerce operator attracting TCS. In case of an inter-state supply, only IGST would be filled. And in the case of intra-state supplies, CGST and SGST/UTGST would be filled. 5. Taxable outward inter-State supplies to un-registered persons where the invoice value is more than Rs 2.5 lakh – The taxpayer is required to fill invoice wise details of inter-state supplies made to unregistered persons or to end customers where the invoice value is more than 2.5 Lakhs under this table. 7. Taxable Outward Supplies to a Unregistered Persons – Under this table registered taxpayer needs to give the Consolidated rate wise details net of debit & credit notes of all the supplies made to unregistered persons or to an end consumer which were not covered in table 5. This includes all intra-state supplies made irrespective of invoice value and inter-state supplies up to invoice value of Rs. 2.5 Lakhs with separate disclosure for supplies. 8. Nil Rated, Exempt, and Non-GST Outward Supplies – Any kind of Nil Rated, Exempt and Non-GST Supplies either inter-state or intra-state supplies need to be stated in this table. 9. Amendments to Details of Outward Supplies of earlier Tax Periods (reflected in table 4,5,6) – Under this table registered person can amend all the invoices, debit& credit notes which are issued in earlier tax periods related to table 4,5,6 & can fill the details of credit debit notes, refund vouchers issued in the current period. 11. Advances received/Advances adjusted in Current tax period/Amendments for the information furnished in earlier tax periods – Under this table registered taxpayer is required to fill the rate wise details of advances received in the current month for which invoice is not issued and that should be added to output tax liability, Advances received in earlier tax periods which is adjusted against the invoices should be deducted now. Advances received in earlier tax period can be added now. 12. HSN-wise summary – All outward supplies need to be categorized on the basis of HSN codes. 13. Documents issued – Under this table registered person is required to disclose the details of invoices for outward supply, invoices for inward supplies from an unregistered person, Revised invoices, Debit note No, Credit No, Vouchers, delivery challans issued indicating the Serial No Series of the above mentioned, cancelled ones & net issued. 2. Or by uploading the GSTR-1 excel file on PayMyGST software. 2. Then go to return dashboard. 4. Select the checkbox, submit and choose a signing method and file GSTR-1. To file you GSTR-1 using the PayMyGST software. 2. Go to the “Outward Supplies” option on Main menu tab and click on the “GSTN Offline Template” option. 3. 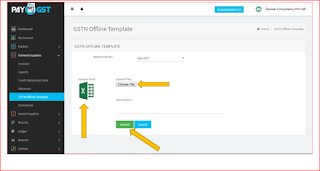 You can click on the sample excel option to download the same excel file in the GSTN Offline Template Page. Once you get the template you can fill in all the required details and upload your GSTR-1 by clicking on the “Choose File” option, the file can be of .txt, .csv, .xls, .xml format.